The reporter Dean Miller is assigned with his cameraman to interview a scientist that is arriving in the local airport. 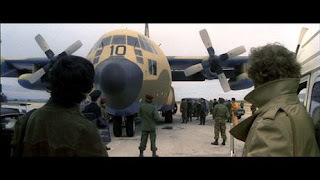 While waiting for the arrival, an unidentified Hercules makes an emergency landing and is surrounded by a military force. When the doors open, a legion of blood thirsty creatures commanded by the scientist attack the soldiers, killing them with hatchets and drinking their blood. Dean tries to warn the population about the happening but is censored by General Murchison. Dean unsuccessfully calls his wife Dr. Anna Miller and heads to the hospital where she works, trying to escape from the city crowded of the increasing walking dead creatures. The story feels like an escape film with many of the elements to keep you interested, Though the Sub-plot with actor Mel Ferrer as the general tends to have no effects on the film what so ever. Only near the end does it really do something? Has a Nice Twist that surpising but I wasn’t in favour of, But after watching I do see where Planet Terror gets it story from. The acting is great we have Mel Ferrer a popular 60s and 70s TV actor who puts on a great performance with Lenzi directing. Lead Mexican actor Hugo Stiglitz is pretty good along with the rest of the cast. The dubbing is average but I couldn’t get an original Italian language soundtrack on my DVD. The Directing is decent for its Low Budget, Umberto Lenzi is an Italian directing Icon when it comes to Crime films, and his import is trying. Good enough though… The Special Effects are fantastic for its time and budget most memorable are the Atomic Zombies or Mutants or Monster whatever you are die hard on calling them. The Attack on the Hospital is definitely something to remember along with the Stella soundtrack composed by Stelvio Cipriani. The 1986 UK Stablecane video version was cut by 3 minutes 5 secs by the BBFC to heavily edit shots of exploding heads, neck bitings, a woman's eye and breast being stabbed with a spike, an arm removal, the elevator attack, shots of bloody wounds, and a woman's breast being sliced off with a knife. All the cuts were fully waived for the 2003 Anchor Bay DVD release. 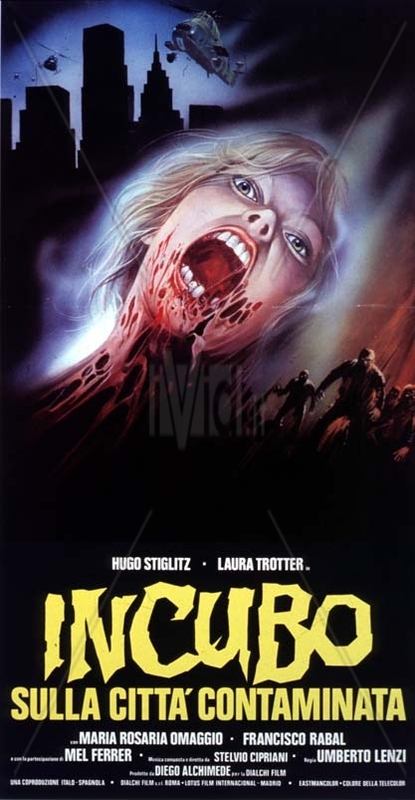 The 1999 German Laser Pacific Red Edition DVD release, Grossgrangriff Der Zombies, uses a Japanese print of the movie. Japanese text appears sometimes at the bottom of the screen when a major character is introduced. A fairly common inclusion for their imported movies, this text usually provides the name of and sometimes a brief description of the character. Overall to me it can be forgettable but there are moments in the film to remember (zombies no doubt). Overall it’s worth a watch and my final verdict is recommended. Btw, have you ever considered becoming a member of LAMB? If you haven't, you should!